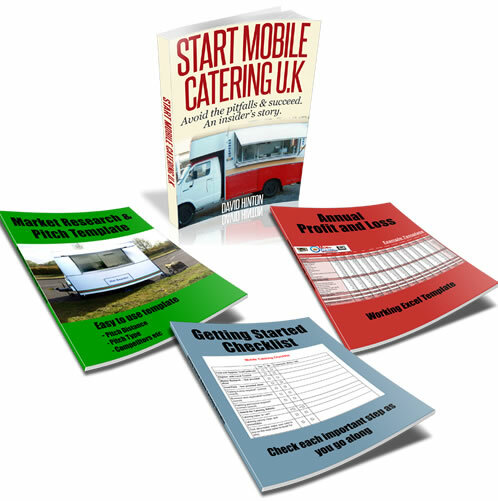 Firstly thank you for all of your previous emails regarding starting up a mobile catering business. I have quite a lot of questions but firstly it’s probably best to tell you my plan so you have a idea of what I am up against. I am buying a catering trailer this year and at the end of the year I am going to move to Devon from Bournemouth where I am currently living. All my life I have done dead end catering jobs and I feel at 32 years old it is now the time for a fresh start and a new business venture. I love Devon and I have wanted to move back there for many years so I can think of no where better to live and be my own boss running a small catering trailer. My plan is to find a good coastal pitch in a busy beach car park where I will be able to provide refreshments to tourists and locals who wish to take their families to the beach for the day, through the summer/busy period and work 7 days a week for as long as a demand will last. I know it will not be easy finding the pitch, and there are important factors I need to consider like be granted permission to trade there and is there nearby competition and will there be enough customers to make it worthwhile, well I do believe it could work especially in a busy beach popular location where there is plenty of parking, public toilets etc. I would want to offer a basic hot and cold food menu also hot and cold drinks and as it would be summer and costal I would also like to stock a small but popular selection of ice creams/lollies. I was also thinking about adding a small selection of Cornish/local products like the good old Cornish pasty and maybe some Cornish ice cream etc. Providing it was a successful pitch and I made enough money in the summer months I would like to move my trailer to a more industrial pitch for a few months of the winter. If all goes well and profit is good I would like to take 2 months off every year maybe after the Christmas shopping when it goes quiet for a while. Hence if I work 7 days a week for say 10 months of the year yes it will be hard and tiresome but i can reward myself with a nice long break and also use the time to undertake deep cleaning of the trailer, make sure all my paperwork is as it should be etc. to anonymous mr ice cream man : advice rejected! in reply to the ice cream man who thinks I am living in dreamland!!! Moving to Devon to sell ice cream ..are you nuts , don't you think that people have lived here and ran similar business for years ? and if there were any pitches available don't you think that the locals would have snapped them up ? You have more chance starting up where you live , at least you know the area . All pitches on car boots, car parks , etc stay in the same hands for years and years with a waiting list as long as you'r arm to take them over and then are usually past on to family members etc. If you think you can just move into an area and trade you are living in dream land . AS for tenders ....unless you are prepared to pay £10,000 plus for a site you will not win one ,and if you did and it was a bad summer you will lose a lot of money , also you will not be made welcome by the established local traders (if you know what I mean). Just one more point ..How many ice cream men do you think operate in Devon ?....answer.. more than any where else in England. I think Devon is the worst place to try and sell ice cream even locals struggle to survive and they were born there . Take my advice ... having been an ice cream man in Devon for over 3o years I know what I am talking about ! Hi , I'm a head ranger with the national trust and have the possibility of a pitch being available at one of our sites near exmouth. If "Andy" is still looking for such, please feel free to contact me on peter.blyth at nationaltrust.org.uk You'll need to move fast as we want to fill this npitch asap. Hi, a few words of advice regarding your move to Devon and your hopes for building a small business here. If I were you I would be inclined to move down here and get a job before you part with any of your hard earned cash. Most Councils in Devon are very strict regarding Street Trader Licensing and in the area I live (Teignbridge) the cost is £1,025 (this year) which must be paid in full before trading is allowed. If I remember correctly you pay a non-refundable £400 on application, the remainder must be paid before you can trade. This does not give you free rein to trade wherever you wish, only in consented areas. Most beaches have a Council owned (usually) cafe or snack outlet these are usually tendered for and I assure you the tenders are high. There is money to be made in them so the outlay can be quite high, the winning tender generally has the option to remain year after year. Markets, car boots etc are also quite often Council run and again can be quite high rent, but usually have the added benefit of on site electrics included. A lot of the car boots that are NOT council operated are "Family concerns" the site operator will be the Mother/Father/Sister whatever of the Catering concern, that after all is the main money maker for a lot of them. I did manage to get onto one when selling a "complimentary" item the main caterer didn't have, they banned me from selling anything other than that product and tea and coffee, after half an hour they told me I had to raise my prices TO MATCH THE THEIRS. The roads in Devon are a strange beast, the 2 main arterial routes A30 and A38 are both owned /operated by the Highways Agency and not the Devon County Highways. They do not allow any trading in laybys and most lay bys on the minor routes are 2 hour waiting restriction prohibited or the local Surveyor will simply tell you to move on under section 148 of the Highways Act. Failure to comply or returning will result in the seizure of your vehicle/trailer. Most industrial estates of any size are usually covered, the rents can be quite high and they have little facilities. If you have identified an area which is so fantastic you can't believe someone hasn't done it already. There is a reason why nobody is there, they've tried and the Council didn't like it so moved them on and prohibited it, do your research. Finally your "quiet time" if you are in a seaside town will be from Oct -May. I have a regular pitch 3 days a week on a Market in a tourist town and many weeks during Winter do not break even. The Summers make up for it. The local EHO are very good and are happy to help and advise where possible. The locals once they get to know you will recommend you to the grockles, in exchange for a free cup of coffee occasionally. Sounds like a great opportunity! I am 31 and have come to the same conclusion as you 'stop slugging your guts out for someone else and spend most days out in the sun!' I am met with generally positive feedback and encouraging words, with the exception for parents and in-laws who are naturally overly concerned. My head is filled with many little costing questions... I hope to obtain a trailer approx £5K, but when it come to writing out some sort of business plan I can't seem to atchieve a realistic estimate of monthly costs (pitch and insurance to gas bottles and night storage). Can you or any readers shed some light on the this tiny detail? I am located in liverpool and hope to sell burgers, hot dogs and jackets and expand the menu with home made curries, chillies and gourmet burgers as confidence and hopefuly money increases. I've read your email and congratulate you on deciding that you want to start a business, and take control of your own future. What you have written here makes a lot of sense and there is no reason why you can?t achieve this if you put your mind to it. As you have pointed out you are willing to work hard to achieve this and I think that you will do well during the summer months as long as you can find a suitable pitch. I can see that you have really put some thought into your idea, which is great. Just a quick thought, whenever the family and I go to the beach, we find a spot and sit down, next the kids want an ice-cream so we have to get up and walk, which what seems like forever to buy/find an ice- cream vendor. I think it would be great if someone could come to us and sell ice-cream, snacks and drinks on the beach during the summer months. It just came to mind while I was reading your email.